The Voice of the Labyrinth | Labyrinth Adventures | Tabletop dungeon crawling with no GM! 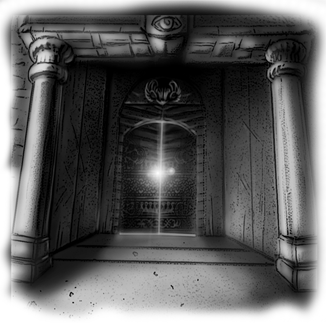 Hello adventurers, welcome to The Voice of the Labyrinth, the place where we will post news and updates about our exciting new game. If you are reading this, then Labyrinth has finally been made available to the public. We are excited to bring you a new era in tabletop fantasy role-playing adventures, and it’s an era without a gamemaster. What does that mean for you? You can have exciting fun role-playing adventures by yourself, or a group of friends can play together without one of them having to run the show. We have all the monsters, wizards, dungeons and enchanted forests you could ever hope to explore, and we offer it at an economical price. Let me ask you a question – how many sides should dice have? Six? Did you say six? Because that’s the right answer, and you can play Labyrinth with only a six-sided die. It’s really simple, you can be playing in no time, and it’s a great introduction into the world of role-playing – for anyone! So let the adventures begin! The doors to the Labyrinth are open! This is how it begins. You are underground, in a freshly dug tunnel, a close space full of the smell of wet earth. It gushes through the toes on your bare feet. You can hear the echo of stones sliding into place in the distance, the workmen and beasts singing low, heartfelt dirges as they chip away at granite. Short, blue, furry creatures carry pails full of mortar into the darkness on two skinny legs, turning and hissing at you as they pass. 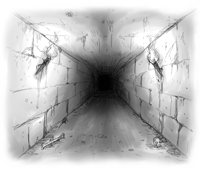 There’s a shadow in the entrance to another tunnel, a man, or something like a man, but too thin, not quite right. The torchlight illuminates a bow, with one arrow nocked. Behind that is a larger shadow with gleaming eyes. It quietly growls. You walk forward in the dim light of torches stuck in the dirt. They are too far apart. You are going in, and the way slopes downward. Eventually a growing light ahead warns that you are entering a larger space. It is huge, once a cavern of some sort. In the middle stands a man with a large glowing orb around him. He wears robes with arcane symbols sewn in gold thread on a purple cloth, and is obviously using the glowing orb to make light for the workers. The light is the color of blood. There are hundreds of workers – ogres, dwarves, elves, beasts and some you’ve never seen. The noise is deafening, the stench unbearable. Stone by stone they are building walls in this space. Both at the outer edges, and internal walls, just waist-high for now, but growing. They are twisting, turning in a confusing maze of hallways-to-be. The cavern goes on for what could be miles, and the construction covers the whole of it. What are you looking at, you ask? But maybe you should be wondering what is looking at you. As your eyes come back to the glowing center of the room you see the man staring at you, a look of extreme displeasure on his face. You take a step back, but too late. He flicks his wrist and glowing black arcs of lightning fly your way, striking you full on the chest. You awake to a horrifying sound. Your alarm clock. You roll over in bed and pound on the snooze button. The alarm on your phone across the room is also chiming. A dream? You don’t have such lucid nightmares these days, but you suppose that’s what it was. No more eating before you go to bed. So you crawl out from under the covers and place your feet on the floor. You scream. The Labyrinth is under construction.